The teacher would occasionally allow the class to while away recess period scouring patches of clover in search of that rare four-leaf specimen hiding among the three-leaf species. If a student was lucky enough to find one, he or she would be prince or princess for a day. I don’t remember ever unearthing one myself, but I do remember the tingle of excitement at the mere possibility of discovering something so unique. And, whether or not you claimed the prize you still got to bask in the sunshine and play on a soft blanket of green, compliments of Mother Nature. Mulling over garden rarities brought a much more recent memory to mind. I planted containers of morning glory and moonflower in my balcony garden last season, as I’ve done for several years now. I use them as climbers that grab onto my net lights and create a virtual wall of lush foliage punctuated with flowers: heavenly blue morning glory blossoms in the a.m. and white moonflower blooms in the p.m.
Now I find these plants quite miraculous to begin with: in sync with some sort of cosmic clock that times them to bloom only in the morning or at night, and, but for just one instance. Amazing! 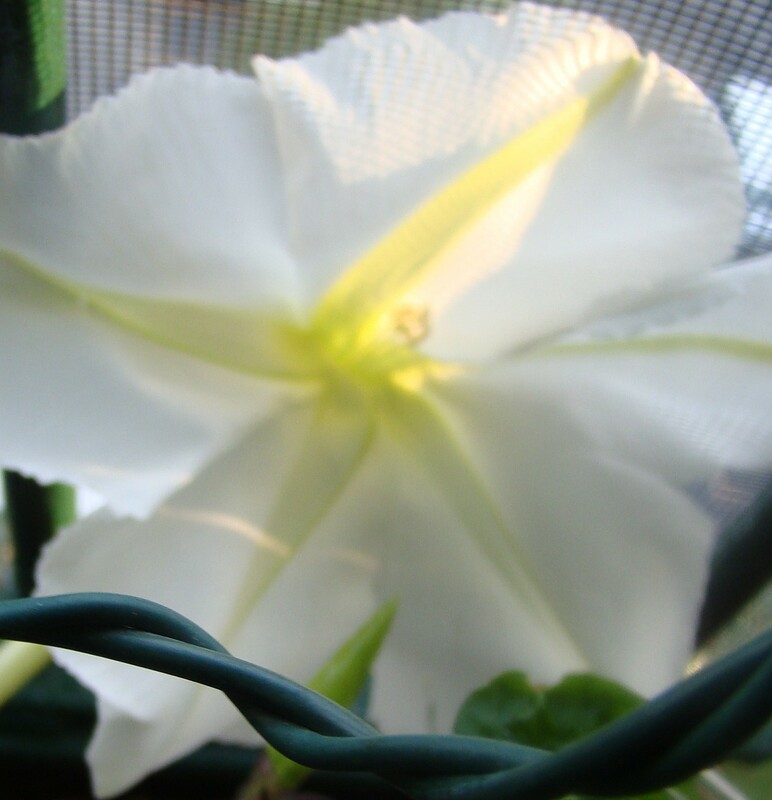 But, adding an additional fascination to the mix, one solitary day last year a fragrant moonflower defied the odds and put its circadian rhythm aside, lingering long enough to join its morning glory cousin in daylight bloom. In fact, on that late-season day both the morning glory and moonflower pictured lasted through the entire day into early evening! I had a moonflower stay open till the morning before a few summers back, but this was even more unusual! What are some of the rare or surprising occurrences you’ve observed in your garden? Please share them in your comments. Something unusual? Not that I could think of. But I find it strange to see my Euphorbia milii flower colour turn out different from when I got them. 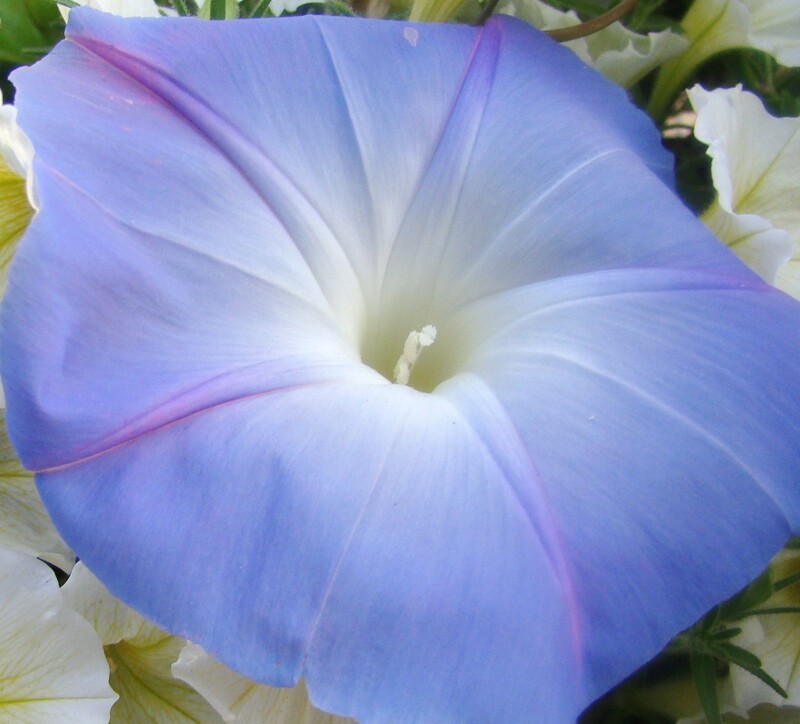 Avis, have you come across dwarf morning glory like Convolvulus Ensign Red? I was tempted to get some. But I think the plant will make a nice addition to your garden. I did try planting the blue and white convolvulus a couple of times but never had much success. I also didn’t have any luck with the four o’clocks, which bloom in the afternoon. I thought morning glory in the a.m., four o’clock in the afternoon and moon flower at night. Maybe I’ll give them another shot… Cheers! What lovely memories from your schooldays. Hmmm, the only surprising occurence in my garden was getting my aubergine to fruit last year, haha. I’ve actually found three four-leafed clovers in my lifetime. Two in the ground and one in the pages of a used book I bought. Each time I felt luckier and blessed. May your lucky streak continue 🙂 !!! One spring I scoured my entire yard and came up with five or six 4-leaf clovers, a couple 5-leafs, and a 7-leaf! I felt so so lucky! I kept them for years, but the might have been tossed when I moved out of my parents place. I don’t think I ever found any before or after that. I guess things in veggies are interesting. Once I cut open a red pepper only to find another perfect teeny tiny green pepper inside. I should post a photo at some point! The lovely photo of the Morning Glory made me think of Georgia O’Keefe’s painting of what I thought was Morning glory. Had to go and check and it was actually Jimson weed, but the feel of the bloom is the same. But there is something about the shape of that flower that is so elegant much like her paintings. Hi, Avis, I never found a clover with four leaves, although I spent hours looking, as a child. Four years ago I planted snowdrops. Only one bloomed the next spring, then it disappeared. I credited the chipmunks with this. Four years later, last week to be exact, a snowdrop bloomed in my shade garden again! Maybe I’ll find a four leaf clover this year, too! my brother and i used to spend hours scouring through the clover patches in our five acre lawn. we found so many four-leafers – and pressed them between pages of a large book to dry. hey, they’re supposed to bring luck, right?! i don’t know about that, but it was fun. it seems that if we found one, then we would find many more in the same patch. Ending a period of “bad luck” for clover researchers, scientists report finding the gene that turns ordinary three-leaf clovers into the coveted four-leaf types. Masked by the three-leaf gene and strongly influenced by environmental condition, molecular markers now make it possible to detect the presence of the gene for four-leaves and for breeders to work with it.